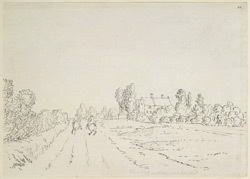 An outline view in ink of ''Diamond Hall'', a public house, a mile from Oxford, drawn by S.H. Grimm. Diamond Hall was along the road between Banbury and Oxford, north of Oxford. In the 17th century this was the only building here. Today this area is known as Summertown, and is a suburb of Oxford. Development here started in 1820 and in 1889, Summertown was connected to the town of Oxford. An 1887 map of Summertown shows the inn gone but only a handful of place names remain such as Diamond Cottages, Diamond Terraces, and Diamond Farm.